Pool Fencing Adelaide—How to Achieve Safety Without Interrupting Views! Pool Fencing Adelaide — How to Achieve Safety Without Interrupting Views! Upgrade the look and feel of your home with our sophisticated pool fencing Adelaide. At Adelaide All Glass, we provide the full-scope of glazier services to achieve luxe and tidiness in all areas of the home. There are endless benefits when it comes to glass products, and the material is way more durable than most would think. Our glass fencing panels are 12mm thick and can be installed in a variety of ways to best suit their environment. Whether you need a gap at the base for water to flow through or hidden hardware for the ultimate infinity look, we have a solution. Additionally, gates can be directly hung on the panels with no posts required. Every process behind our pool fencing Adelaide has been developed to make the lives of our clients simple! Upgrade your Indoors to Match! Did you know that as well as pool fencing Adelaide, we also provide a range of indoor glazier needs? Our team have glass for table tops, shopfronts, mirrors, countertops, splashbacks, glass partitions, shower screens, shelving, balustrades and more! We can install all of these features to achieve consistent elegance throughout your home. The best part is definitely the easy-maintenance because our glass products require nothing but a routine polish. Unlike many kitchen and bathroom products which are regularly exposed to water, corrosion is not a problem. Neither is water damage or discolouration, because of the way it withstands chemicals and contaminants. It’s also an excellent insulator against electricity for added safety! For a stylish finish that will remain bright and shiny for years to come, it’s time to go glass. Match your indoors with your pool fencing Adelaide and take in the fuss-free benefits of Adelaide’s favourite material. What are some of the other benefits with glass products? 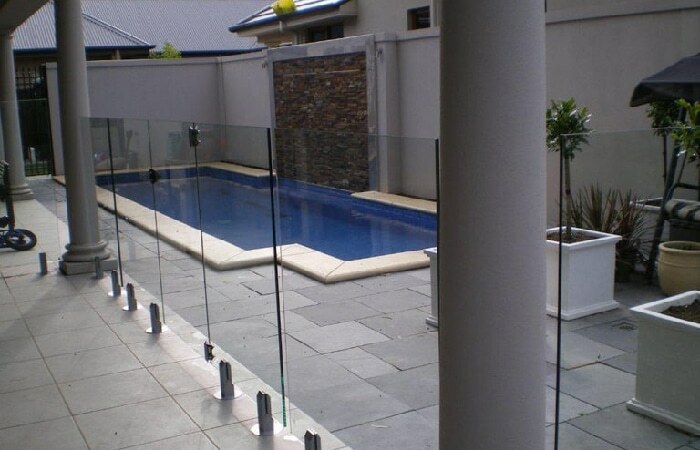 Aside from easy maintenance and durability, choosing glass for your pool fencing Adelaide comes with plenty of benefits. Firstly, glass transmits up to 80% of daylight in both directions without weathering or yellowing. It’s also weather proof and UV stable, so there’s no chance of damage from outdoor elements. On that note, the uninterrupted daylight enables you and your plants to make the most of the Australian summer. If your poolside landscape is looking a little glamourous, you don’t want to hide it behind a big ugly fence! Glass is a great way to add safety and segregation while still showcasing your landscape. It also creates the illusion of more space, which is ideal for smaller yards where size has been compromised for the new addition. For more information on any of the products or services we offer here at Adelaide All Glass, call us today! Our pool fencing Adelaide is definitely a great place to start. The number to call for all bookings or enquiries regarding our pool fencing Adelaide is 0418 843 085. Additionally, we have a 24-hour service for any emergency repairs you require! Customer satisfaction is our absolute priority, so you can always expect service with a smile.